Got the first bill for my recent medical sabbatical. The grand total is $20,181.96, but my favorite part is the big letters on top saying “THIS IS NOT A BILL.” So the next step is to see what the insurance company says. Click to inspect the full size version. 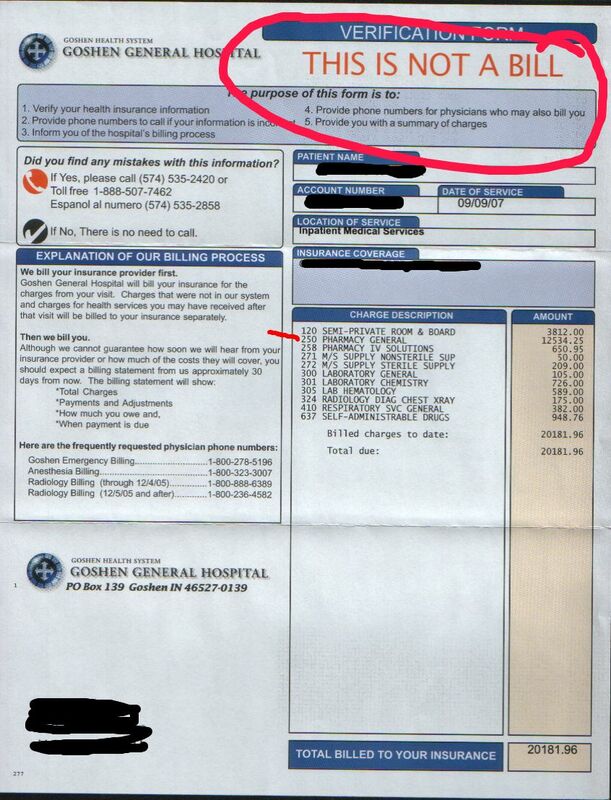 The vast bulk of the bill is of course “Pharmacy General,” at over 12.5 thousand bucks, thanks to that dose of Remicade. But $3812 for semi-private room and board?! You’ve got to be kidding! For a five-day stay, that comes to $762.40 a day. It was a nice place, but not near that nice! And the food was ok, but certainly nothing special. That’s around a house payment a day. Unbelievable. Maybe I should look into using a different place for my next sabbatical. We’ve been in Oregon since last Wednesday for my Dad’s 80th birthday bash. That’s how Mandy feels about Utopia! Here’s Mandy’s Great Uncle Kenny holding her for the first time. Here’s me in the hospital last week. I had a number of people stop in to visit me, but this one repeat guest was my favorite. During the day Jewel would bring my little girl in and she would lay with me on my bed. I’d feed her and we would nap the afternoon away! So anyway, I’m out now of course. I’ve been feeling a little better each day, still pretty weak and tired but definitely making progress. I’m going to post about financial matters, just for fun. I’m going to mention specific figures. See, in the circles I grew up in money matters weren’t something you usually talked about in public. How much you earned at work, what something cost, etc. etc. were usually kept under wraps. But I am fascinated with business matters and financial issues, and I like to know what the numbers are. They make things much more interesting. 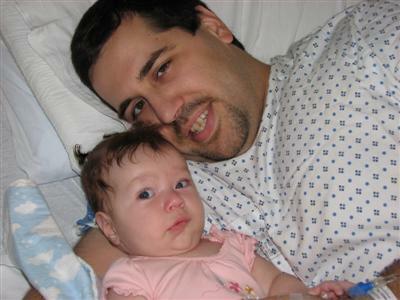 When Mandy was born, the difficult labor and eventual C-section culminated in a six-day hospital stay, if I remember right. The total bill for that little vacation came to right around $20,000. Wow! Thank you God for medical insurance. Having a chronic disease, I have to take a lot of prescriptions every day. Unfortunately, many disease-specific drugs don’t have cheap generic counterparts. My out-of-pockets costs, AFTER insurance covers the majority, are over $100 a month for my prescriptions. Regarding my current sabbatical in this medical resort, I came in here last Sunday morning, and the plan is to send me home today. That’s what, about five days. It will be awhile before I know the total bill of course, but I have one little tidbit I want to share with you. When I was first stricken with Crohn’s Disease, I was deathly sick for about three months before the docs finally got it under control. They piddled around with this weak drug, then that ineffective drug, and on and on. Finally as a last shot before slicing me open and hacking out my colon, they tried a new (very expensive) IV drug called Remicade. It did the trick, I literally started feeling better overnight. So this week, they finally broke down and brought out the Remicade yesterday. Hopefully it will do the job again and I’ll be feeling better soon. I wanted to know how much it cost though, so I had the nurse look it up. This one IV infusion of Remicade gently dripped into my veins yesterday cost. . . . $10,714.25. Dead serious. That is not a joke. So anyway, I hope you enjoyed those numbers. I know I would have if someone else had done something like this, “do unto others” you know. What is it with my veins, and why do they keep letting me down?! I’ve been stuck (both for blood and IV’s) more times than I can count this week, and most of them were failed attempts. I hear that the nurses are being told in report that I’m terrified of needles. I wonder why. Regarding tape, I had a great idea this morning. They’re really good about checking for allergies, next time I’m just going to tell them I’m allergic to tape! That way I don’t have to fight off the tape attacks every time they come to stick me, they can just look and see, hey, he’s allergic to tape. My wife told me they get paid by how much tape they use, that certainly would make sense. This poor old codger in bed 2, he’s always begging for his pain meds too. They’re such sticklers in here about not giving you your meds a second earlier than they’re supposed to. What a crock, I say. If you need more before it’s time, then they’re not working. Dose me up. The nurse just asked him what his pain is on a scale of 1 to 10, and he said 20. After years of having gallons of blood brutally sucked from my arm, I only recently discovered what I’m going to share with you now. I’ve been a little sick the last few weeks with a Crohn’s flare up, and yesterday morning they put me in the hospital. Thankfully, some genius here at Goshen Hospital put in a patient wireless access point so contact with the outside world can be maintained. But anyway, my tip about blood draws is this: you can refuse tape! I usually request the stuff that goes all the way around your arm, but lately the blood sticker people haven’t been carrying it. So I have just been flatly refusing tape, and they don’t push the matter. They just apply pressure for a little bit and let it go. Here’s another tip for the next time you stay in a two-bed hospital room. Use headphones for your tv! Come on! Man this is annoying. I’ve been listening to Glenn Beck and Glad Gershwin with my earbuds, trying to drown out the cacophony from across the curtain. Guess who was my nurse last night? My own wife! I’ve been gone from here for a while longer than I intended. I didn’t mean to be though. Between working full time, spending several days in the studio, being sick for the last while, hosting family gatherings, hosting miscellaneous other guests, and striving to be an exemplary husband and father, there hasn’t been much time left over for the income-free pursuit of ITF. But there was something I wanted to talk about, and I forgot to in the last post about going to By and Amy’s wedding. I get very weary of long road trips. But a couple years ago I stumbled on a great activity during such times: have my wife read my book to me! She usually doesn’t mind, depending on the book. So no more Dean Koontz books. A few weeks ago she bought me a handful at a book sale for a quarter a piece, but I have to read them myself. So anyway, the book of choice for the road trip to the wedding was Upstairs the Peasants are Revolting. It’s a great book, I enjoyed it very much.